Take a yacht, add distinct dining and shoreline scenery, and enjoy an array of Los Angeles cruises, featuring dinner & more! Cruises from Los Angeles are a unique way to unwind, dine out, or celebrate a special occasion in the City of Angeles. 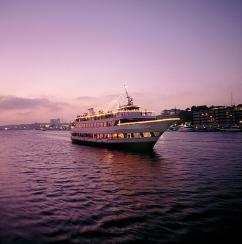 Experience the Pacific waters in a whole new way with a Los Angeles Dinner Cruise from Marina Del Rey or Newport Beach! Board an elegant yacht and float by breathtaking sights like Balboa Peninsula, Corona Del Mar, Mariner's Mile, and Playa Del Rey. 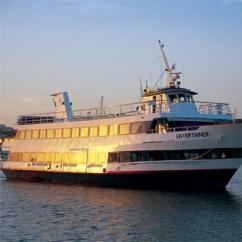 Not only do these cruises from LA come with unrivaled views of the coastline, but guests also enjoy exquisite amenities like: private tables, a boarding glass of champagne or sparkling wine, a 4-course meal, DJ entertainment and dancing, cash bars, and plenty of deck space for savoring the serenity or romance of the waterfront as the sun sets. 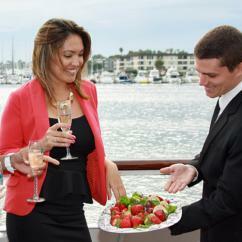 And if bottomless mimosas and impressive buffet spreads are more your speed, try a Champagne Brunch Cruise in LA! Enjoy time with family or friends, or even do a Sunday date a little differently, floating along the magnificent waters of Southern California for a couple of hours. Add even more romance to time out on the water with an array of gondola cruises out of LA. These intimate, 2-person outings come with a private gondolier to guide you and your special someone through the Newport Harbor. Spend an afternoon on the water with a gondola lunch cruise, soaking up sunshine and enjoying quality time over a picnic of fresh bites and beverages. Wind down the day with a romantic dinner, or satisfy a sweet tooth on a gondola dessert cruise! Waterfront dining doesn't get much tastier or more memorable than this — so make a special occasion even more unique with Los Angeles dinner cruises, brunch outings and gondola dates.